One of my team’s outreach activities this year was an engagement with the Americas Conference on Information Systems (AMCIS). AMCIS is an activity of the Association for Information Systems (AIS), a leading professional society of more than 4,000 members engaged in the study of information systems. During the event I was fortunate to participate in a session on the joint ACM/AIS “MSIS 2016” curriculum framework. In Fall 2014, the Association for Computing Machinery and AIS empaneled a working group to develop curriculum guidelines for Masters of Science degree programs in Information Systems. It is the fifth in a series of curriculum guidelines since 1972. This project is a further expression of the initiative begun in the 1960s by ACM to establish a body of knowledge and core curricula specifications for the computing disciplines. The GIS&T Body of Knowledge project initiated in the 1990s by the University Consortium for Geographic Information Science emulated those efforts intentionally. Now available as a public discussion draft, MSIS 2016 represents a significant advance over earlier related efforts. 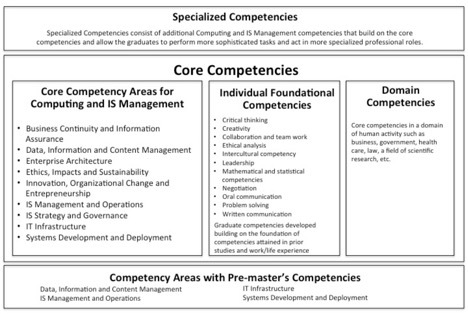 In contrast to content-centered specifications (like the GIS&T BoK) that are organized as hierarchical “Knowledge Areas,” “Knowledge Units,” and “Topics,” MSIS 2016 consists of “Competency Areas” and “Categories,” “Individual Foundational Competencies,” and “Domain Competencies.” Its greater emphasis on what students are able to do with knowledge, rather than on knowledge for its own sake, likens MSIS 2016 the U.S. Department of Labor’s Geospatial Technology Competency Model. In the version of MSIS 2016 presented at the AMCIS conference (dated 7-15-2016), none of the Competency Categories or Examples included the terms “spatial,” or “location,” or even the suffix “geo.” I expressed concern about this omission during the working group’s briefing at the conference. The group kindly invited me to submit comments on their draft, which I did (and which they published at the MSIS 2016 website). Their open-mindedness is evident in the fact that they added the example “make explicit the spatial and temporal dimensions of information” to the Competency Category “Creating an information architecture for an organization” in the version of MSIS 2016 issued after AMCIS – the one dated 8-18-2016. The MSIS 2016 Working Group’s nod to spatial is a collegial gesture. But there are other hopeful signs that there may be a place for “G” in IS. One sign is the five young faculty members and graduate students who participated in the focus group I conducted at AMCIS, and who volunteered to serve as GIS ambassadors within their academic units. Another is the example of GI Scientist Brian Tomaszewski, who is successfully embedded in the IST Department faculty at Rochester Institute of Technology. If you’re aware of other examples, let us know. Chances are they already have access to Esri technology through their university site license. We’d like to help them make the most of it. Goodchild, Michael (1992). Geographical information science. International Journal of Geographical Information Systems 6 (1): 31–45.